The global glycerol market is growing at a CAGR of 6.30% from 2012 to 2018, according to a research report published by Transparency Market Research. 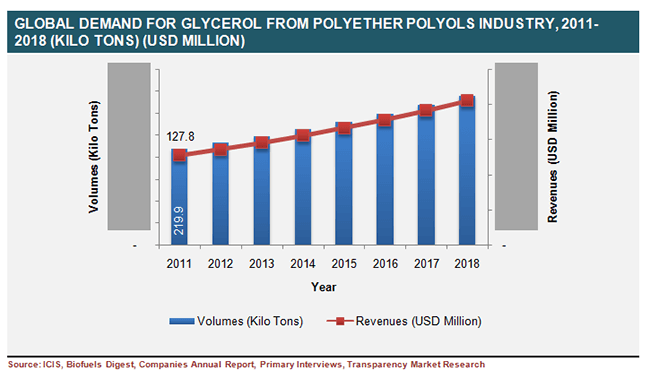 The report, titled “Glycerol Market - Global Industry Analysis, Size, Share, Trends, Growth And Forecast 2012 - 2018”, dissects the global glycerol market to reveal the key factors that influence it, along with market statistics and forecasts.The report states that the global glycerol market will be worth US$2.10 bn by 2018, keeping the estimated CAGR in mind and calculating ahead from the market’s 2011 net worth. In terms of volume, the global glycerol market weighed in at 1,995.50 kilo tons in 2011 and could reach an overall volume of 3,060.4 kilo tons in 2018.The report states that the food and beverages sector is set to be the fastest growing end user in the global glycerol market. In terms of demand from the global glycerol market, it is expected to grow at a CAGR of 7.3% from 2012 to 2018. This growth is expected to be a key contributor towards the overall growth of the global glycerol market in the given forecast period. According to the report, the top consumer in the global glycerol market by region is the Asia Pacific. The region consumed nearly 36% of glycerol by volume in 2011. The key factor that has caused the region to dominate the global market is the rapidly changing lifestyles of individuals, supplemented by improving economies and growing amount of disposable incomes available per individual.The report explains the scope for the global glycerol market in terms of its application segments, which include food and beverage storage facilities, healthcare, personal care, and pharma.37.0% of overall glycerol consumption in 2011 was done collectively by the personal care and pharmaceuticals segments. The report also states that glycerol has been increasingly used as a platform for renewable chemical intermediates. One of the major restraints on the global glycerol market focused on in the report is the volatile nature of feedstock supply and prices. According to the report, this volatility, coupled with low refining margins, forms a substantial challenge to the global glycerol market.One of the major transitions in the global glycerol market as documented in the report is the change in the manufacturing process of glycerol. While previously produced through synthetic means, the global glycerol market is currently looking towards eco-friendly methods to create glycerol, which includes the transesterification process of manufacturing glycerol from biodiesel.The key players detailed in the report on the global glycerol market include Wilmar International, Kuala Lumpur Berhad, Croda, Dial Corporation, P&G Chemicals, Emery Oleochemicals, and the IOI Group.